It was relatively innocuous enough, as far as pranks go; pranks posted to Facebook on April Fool’s Day are a dime a dozen these days. Paul simultaneously felt surprised and a little guilty that so many people thought he was serious. There’s also a funny story about the info getting relayed to some of my coworkers who were then wondering why in world I wasn’t saying anything about moving to Washington DC, but I’ll leave that one for another day. On the other hand, I’m sure a little, just a little part of Paul was doing a little evil laugh inside his head. You see, he has a long history of pranks. I was first made aware of Paul’s proclivity for messing with his friends when we worked together in college. The morning after a January 2005 snowstorm, an email with pictures from an anonymous email account was sent to everyone on the RA listserv. 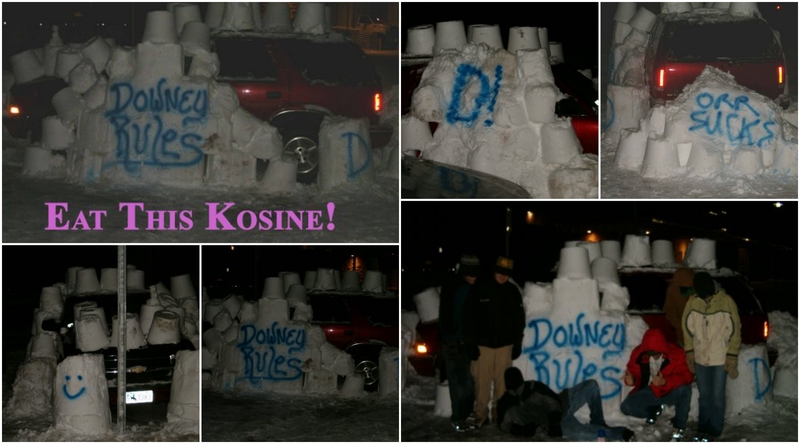 Apparently, our Hall Director’s car had been buried in snow by the staff of another dorm. That’s Paul in the black coat and khaki pants. He sort-of confessed/broke character later that day and helped dig out our boss’s car. I’m guessing Brandon got over it; he married us 2 1/2 year later. I did confirm with Chris that Paul did indeed deserve such treatment. Turns out, when Chris and Paul lived together in a stereotypically terrible college apartment in Laramie, hidden mousetraps were commonplace. The mousetraps first appeared in the apartment, because, well, they had mice. Then one day whilst setting traps, I don’t remember if it was Chris or Paul, but one of them called out the other’s name to get their attention and then simply tossed them a set mousetrap. And so the game was on; 10 or so year later, I went ahead and hid half a dozen mousetraps in Paul’s 10 x 7 dorm room just before I headed home to Denver. Paul called later that night; after finding the first mousetrap, he spent the next hour hitting everything he could with a clothes hanger in hopes of finding the rest of the traps. Fast forward to June 2006. I was still living in Denver, and had moved into my own apartment the previous February after living in Jenn and Phil’s basement for 9 months. Jenn and Phil were headed out of town for the weekend and asked if I could check in on their place. Living either near or in Colorado for most of their lives, Jenn and Phil are avid Colorado Avalance fans; Paul was born in Detroit and has been a Detroit Red Wings fans for a very long time. In the week’s leading up to my housesitting gig, Paul and I somehow got on the topic of of pranking Jenn and Phil. We thought it would be funny if, when they arrived home from their trip, there was a Red Wings Banner hanging in their basement. 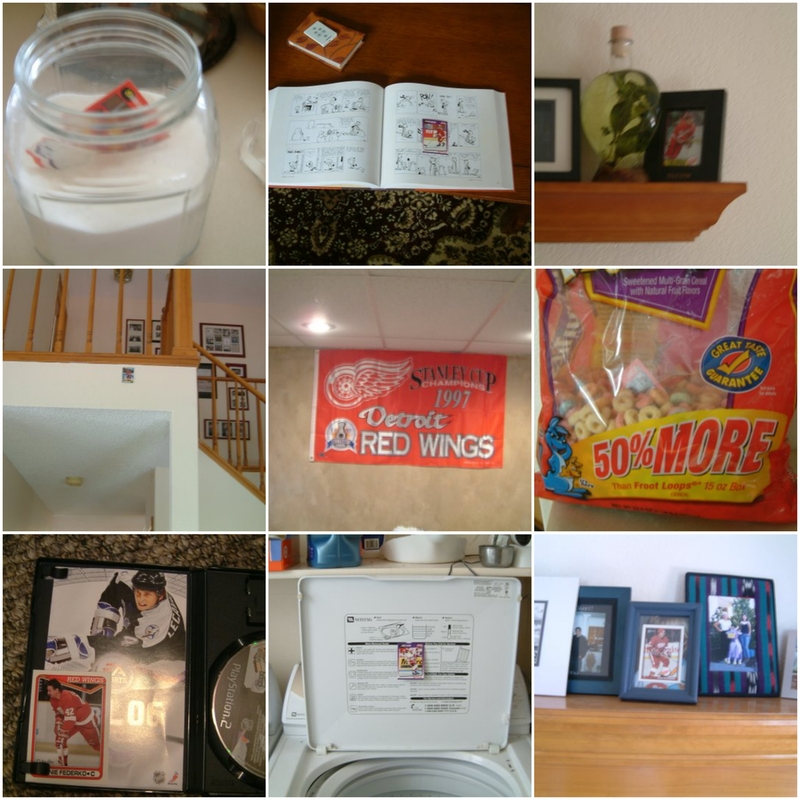 And then somehow we got the idea to hide Red Wings trading cards all over their house (knowing they would think the banner was the only joke) and then Jenn and Phil would find the cards randomly and when they least expected it. So I bought a banner and trading cards off of Ebay and hung the banner and hid cards around the house. I don’t think the last cards were found for a couple years – when Phil lent his sister their Firefly DVD boxset. And then there’s Lenny, the big blue bunny. Someone won Lenny at a carnival (maybe the state fair?) over 20 years ago. Lenny sat shotgun while cruising CY Avenue in Casper among other adventures before he started being passed back and forth between Paul and Chris in various and creative ways. This post is already getting long, and Lenny deserves his own separate backstory. 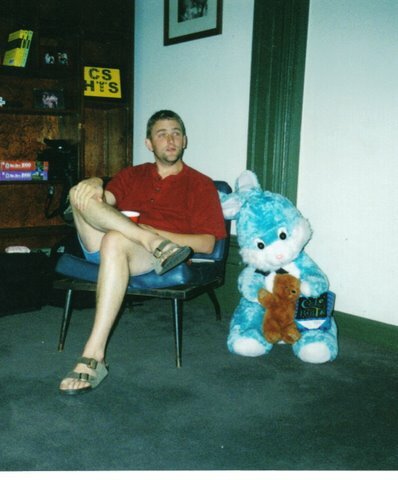 In the meantime (or because a post about Lenny may never actually come to fruition), here’s a picture of Lenny (with the infamous Chris) after he was mailed to Paul in Kentucky for his 29th birthday before his friends and family joined him for the celebrations. 1.) Besides this latest prank, he/we haven’t pulled off one in a very long time. 2.) He’s never gotten me back from the Mousetrap Incident of 2005, so I’m long overdue. Ha! I hadn’t heard or thought about Lenny in a very long time. Thanks for the flashback. Thanks for a great post, Kathryn. If I didn’t know better, I’d think that you’re egging Paul on!